It's funny how some rather ordinary looking models can be harder to find than very similar looking models. A great example is the 1961 Glendon. Up until recently I had never seen one - although I thought I had lots of times in the past. Every time I spotted a Glendon, it turned out to be a 1965 Martin. 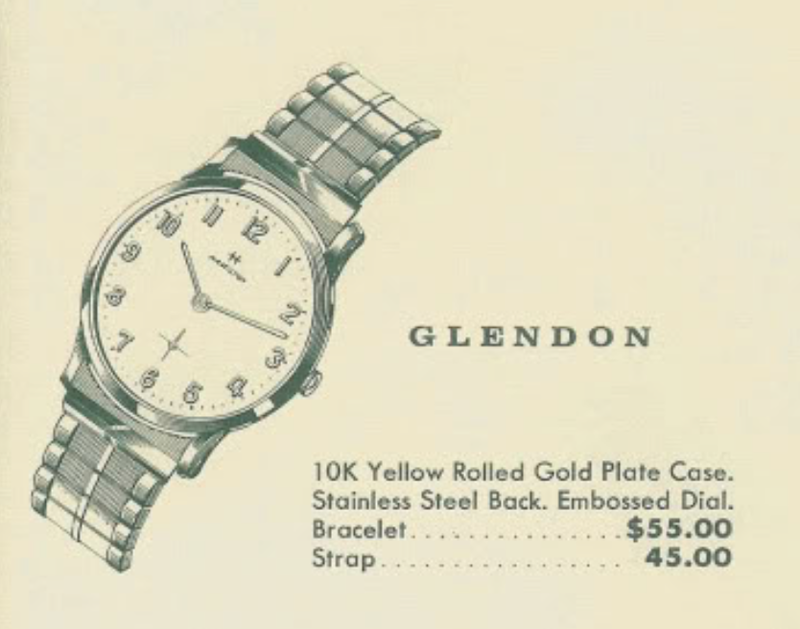 The Glendon was introduced in 1961 and produced for two years. Based on the Hamilton catalog, it was about as basic as you could get... round with an all-numeral dial. You could get it on a strap for $45 or a metal bracelet for $55. 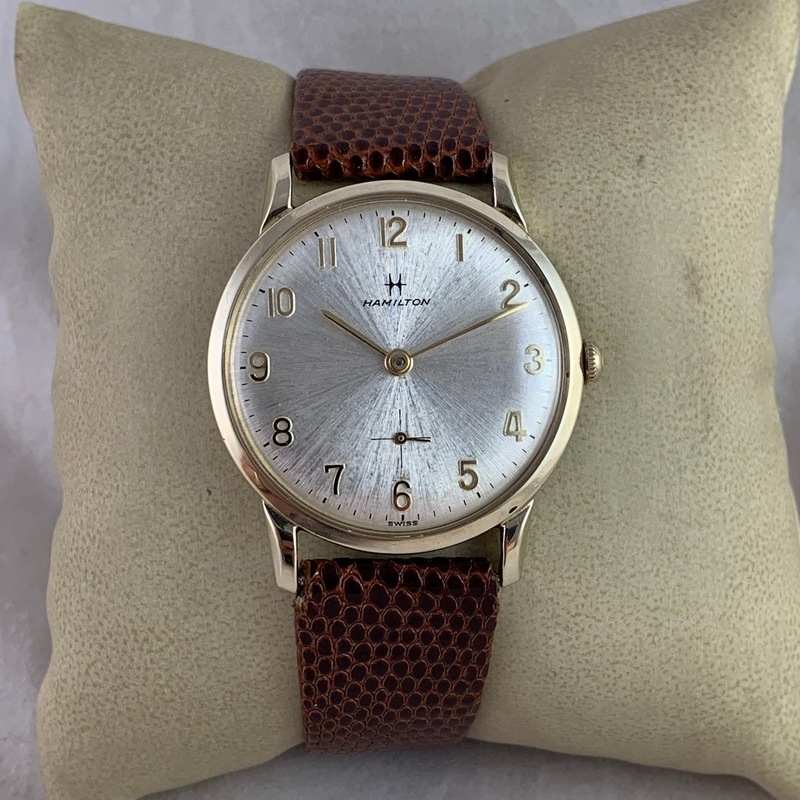 That's about $450 in today's dollars so although this was an entry-level Hamilton model, it was not inexpensive. 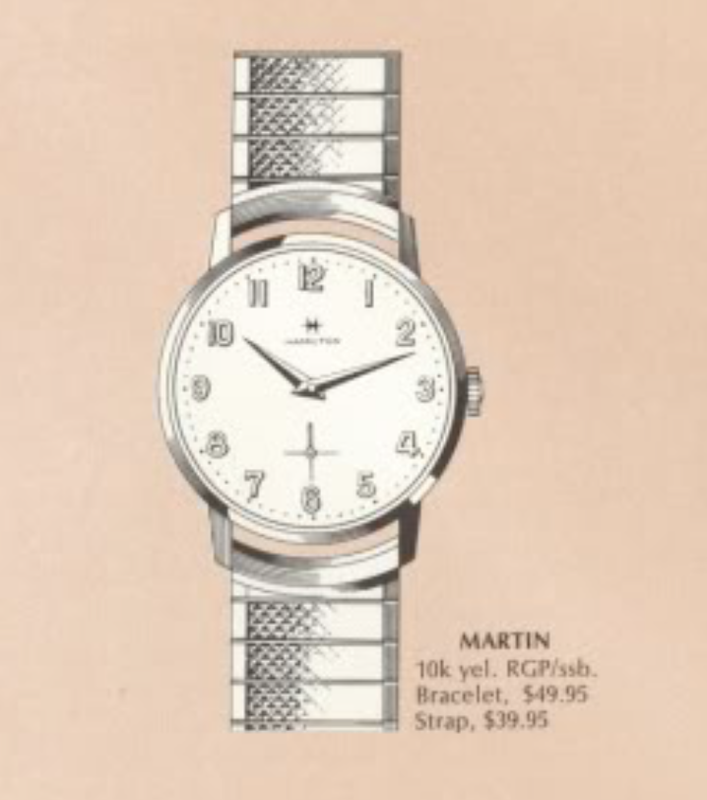 For comparison, here's the catalog image of the 1965 Martin. It was only made for a couple of years as well but I've seen quite a few of them in the wild. Can you spot the differences? Based on the artists' rendering of the two models, the biggest difference is the dauphine hands on the Martin vs the baton hands on the Glendon. The shape of the lugs is also slightly different with the Martin being a smidgen more angular. You could also use the movements to identify the two models. The Martin uses a Hamilton 686 Swiss-made movement and the Glendon uses the earlier Hamilton 673. 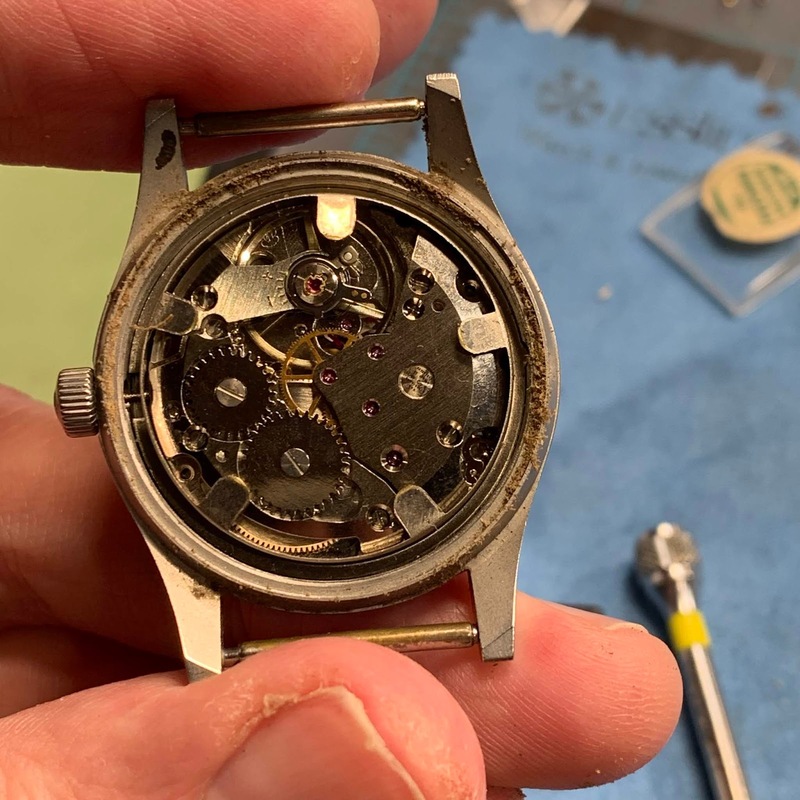 As I said at the start, I recently had the opportunity to see a Glendon first hand after a fellow collector sent me theirs for an overhaul. 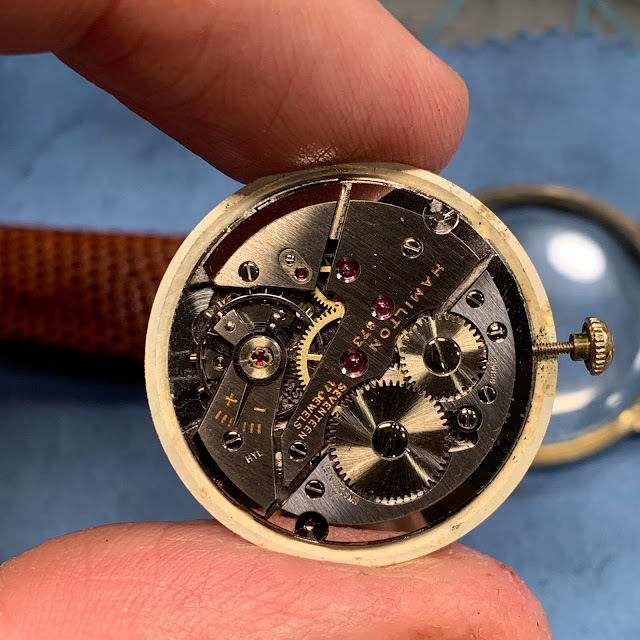 Seeing it in person, another obvious way to differentiate a Glendon from the Martin is the Glendon has a textured dial with a unique radial finish. 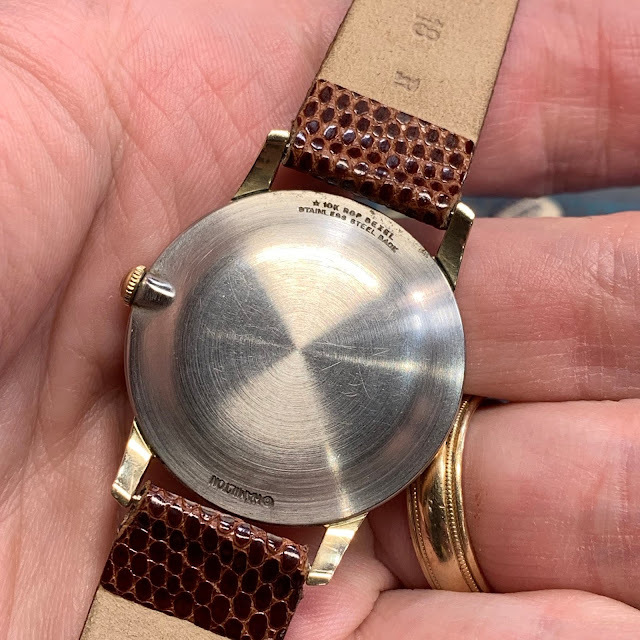 The Martin's dial is textured too, but with vertical stripes. The case is a two-piece design with the stainless steel back popping into the 10K rolled gold plated bezel. Once the bevel is removed you can lift the dial and movement out of the case back. 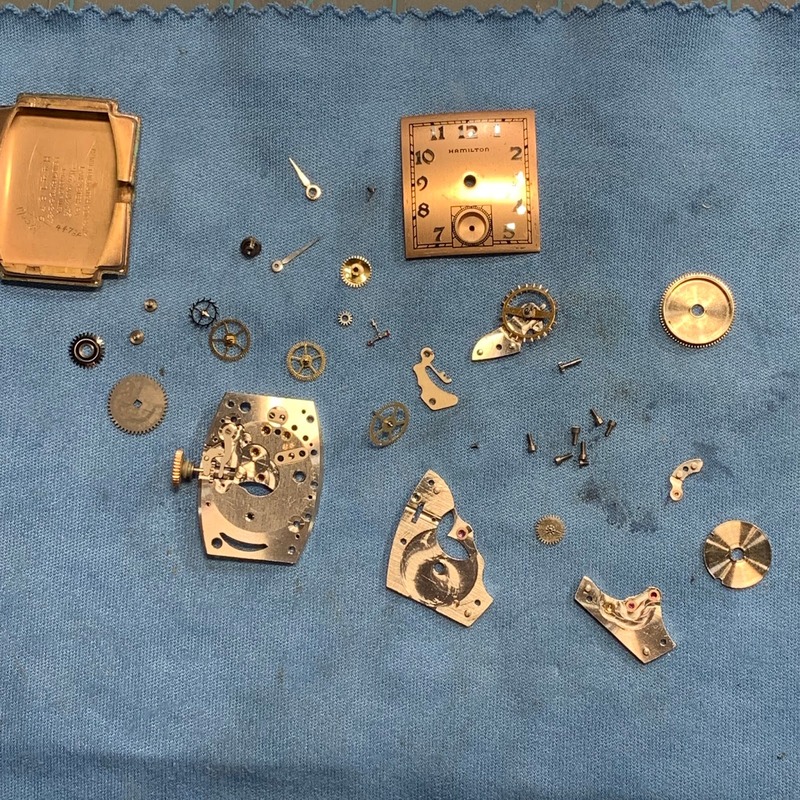 This is a complicated dial, I bet it would be difficult to get this dial refinished correctly. 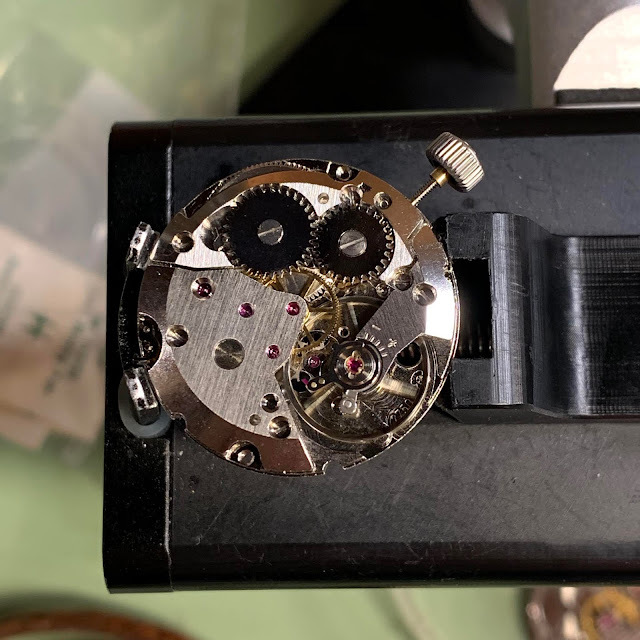 Although I don't see any past service marks inside the case, this movement is in surprisingly nice shape. I tried to polish the crystal but there are still some very fine wavy scratches or crazing. 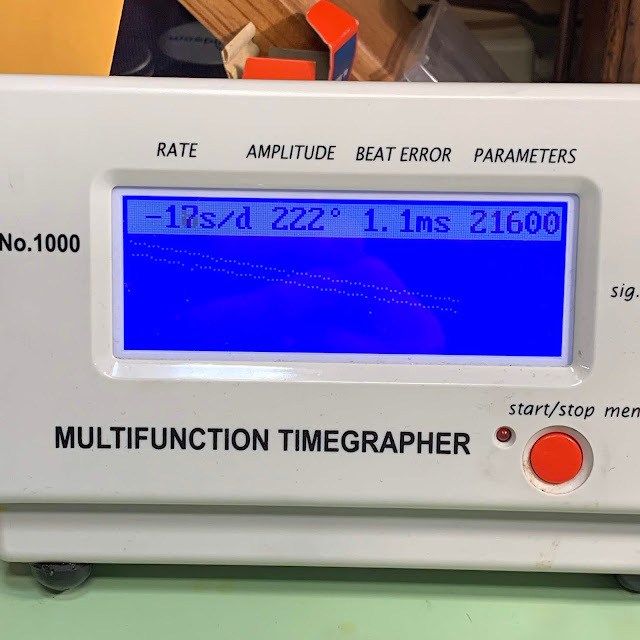 It doesn't look terrible in front of the dial but a new crystal will be better. 30.1mm should do the trick. 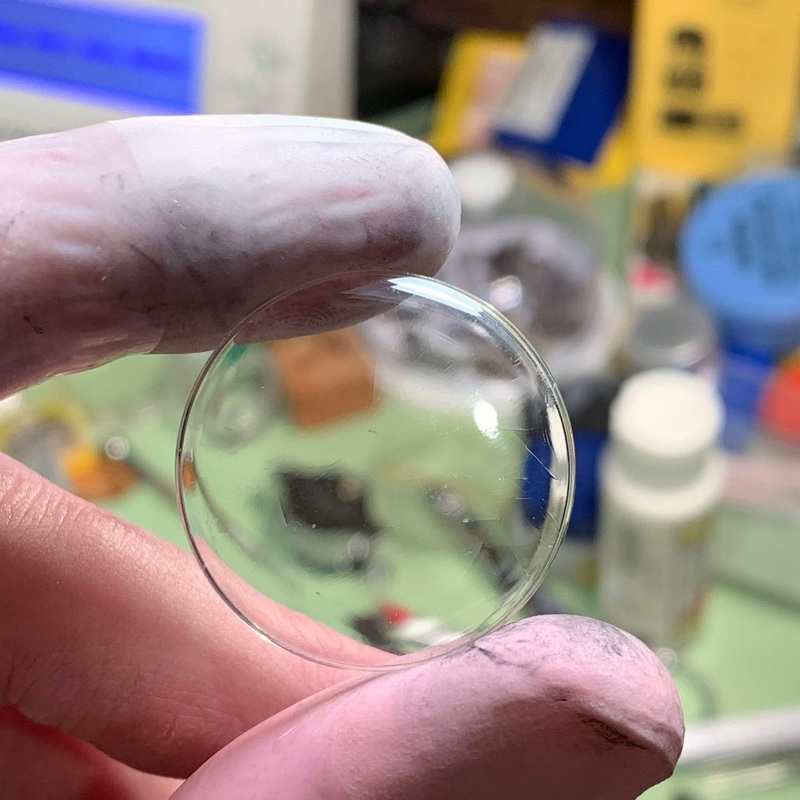 I'll use a PK style low dome crystal since this is a very thin watch with low profile hands. Although the watch looked clean before, if even more shiny now that it's been to the spa. It's now back together and running with a good motion. Not too shabby, let's speed it up just a little bit. 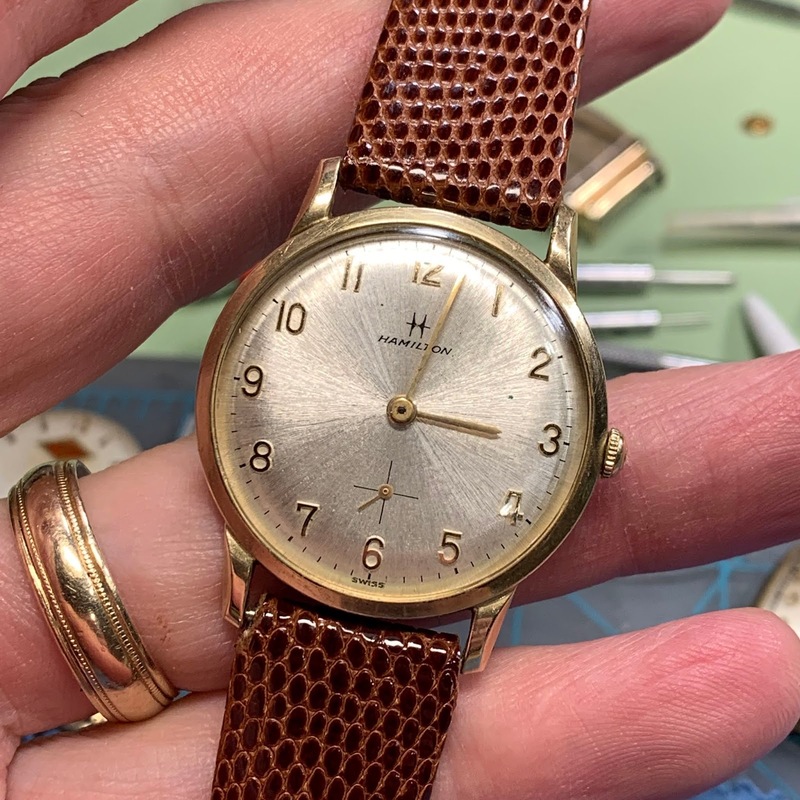 There... that will do nicely, Nothing to complain about with this almost 60 year old watch. I'd say a little spit and polish went a long way toward making this Glendon look and run like new. It's a nice looking watch, I'm surprised there aren't a lot more out there. One of my favorite models is the 1939 Ross. It's not a very large model but it has a number of varieties in both case material as well as dial patterns. You could have a very nice Hamilton collection by just finding the various Ross configurations. Technically, a new model was introduced in 1940, the Coral Ross. I mentioned it in my 2012 posting on the Ross. I've restored a bunch of them over the years but I was surprised I didn't do a specific post on the Coral Ross - until now. The model was introduced in 1940 and only made for two years. 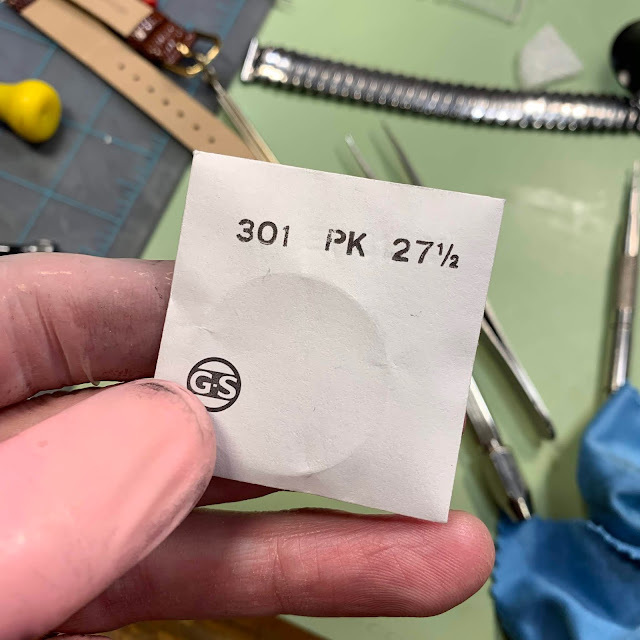 It's interesting to see that the applied gold numeral (AGN) dial was more expensive than the polished numeral dial shown in the 1940 catalog. Personally, I really like the polished numeral dial and variations were available for the yellow Ross and the white gold filled version too! 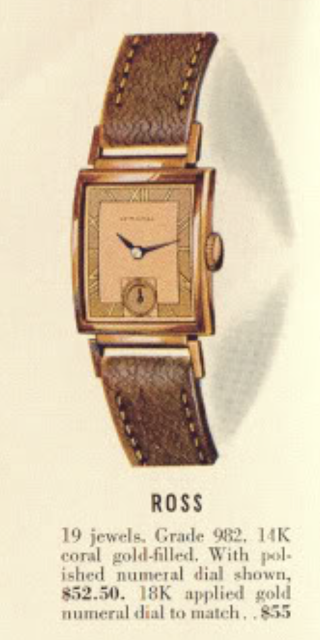 The 1941 catalog showed both of the dial options for the Coral Ross. 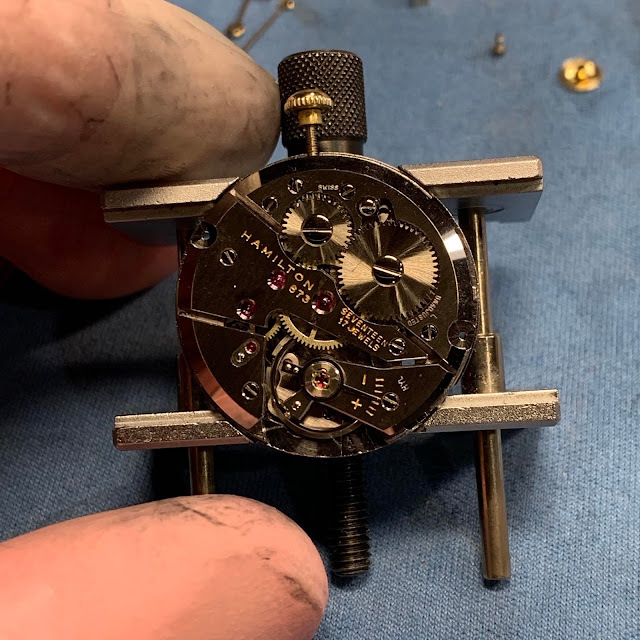 The polished dial version got black hands while the AGN version got rhodium plated hands to match the rhodium plated solid 18K gold numerals on the dial. 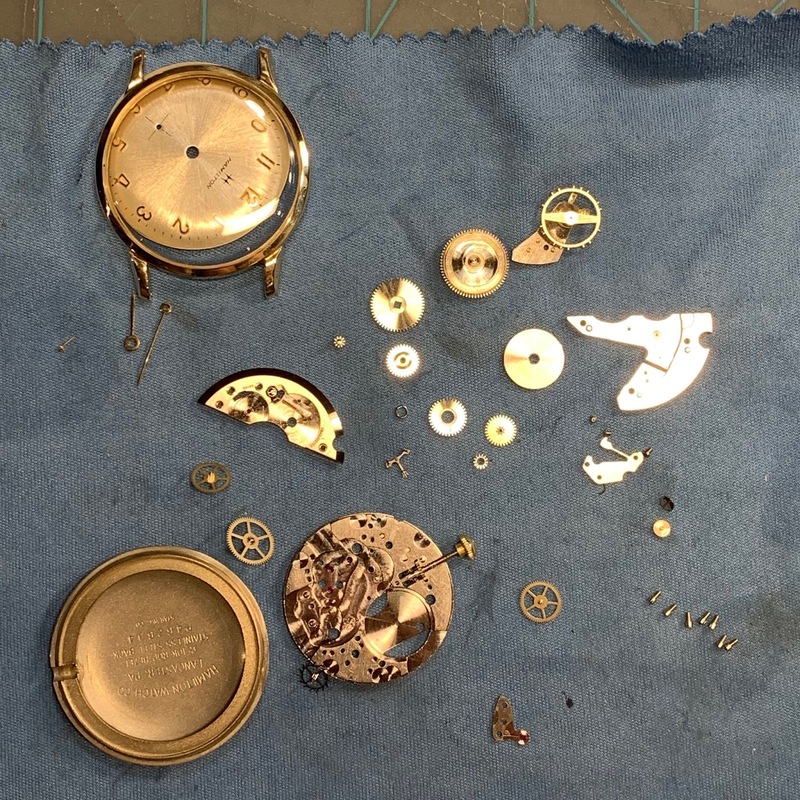 Being made in 1940 and having a 14K gold filled case, you should find a 19 jewel 982 movement under the hood. 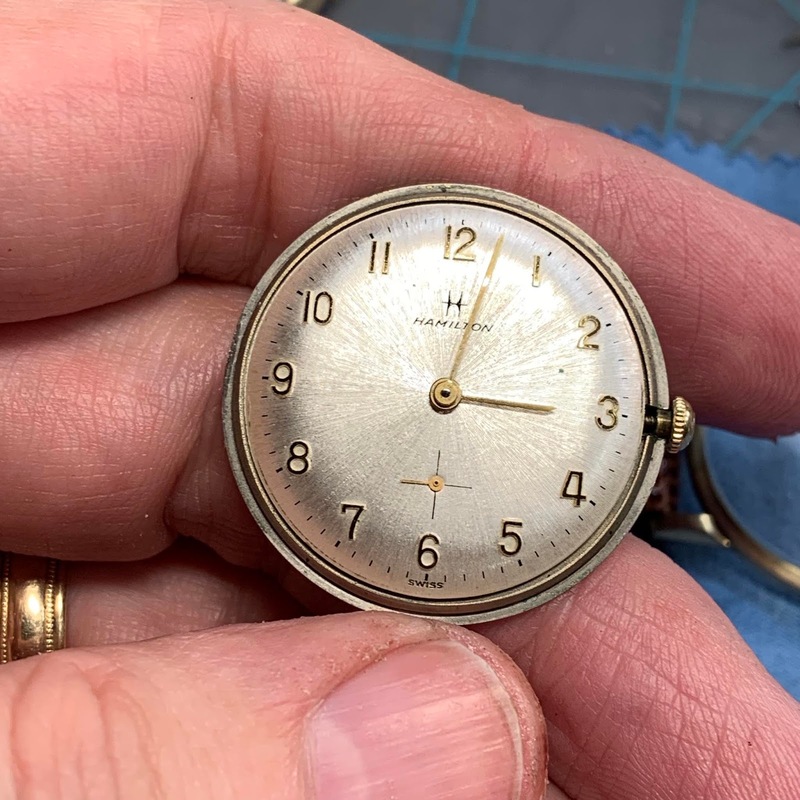 The same is true for the white and yellow cased versions but they could have been made in 1939 and received the 17 jewel 980. So what's inside the case can help date the watch. My project watch arrived in working condition, well ticking condition anyway. It's a bit dirty but I don't see any really rough signs of wear. This model can often show wear through on the edges and especially the corners. The crystal definitely needs to be replaced and the second hand is missing in action. The back is nicely hand engraved with the original owner's name. 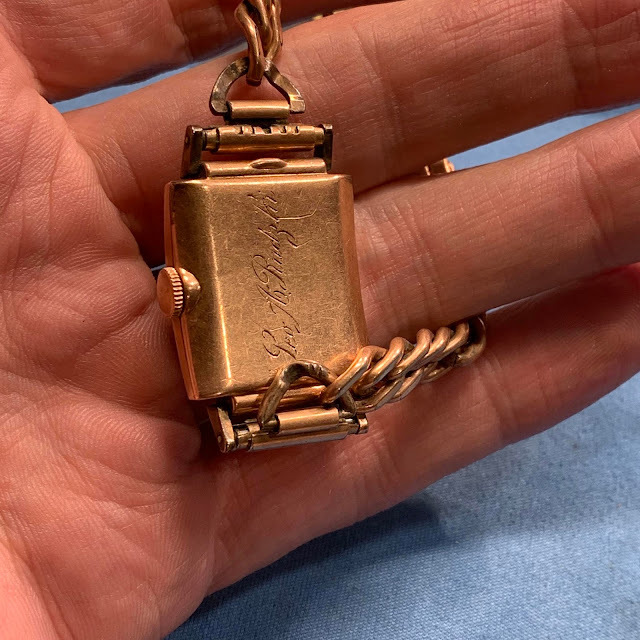 The bracelet is rose gold filled too and made by Hadley. 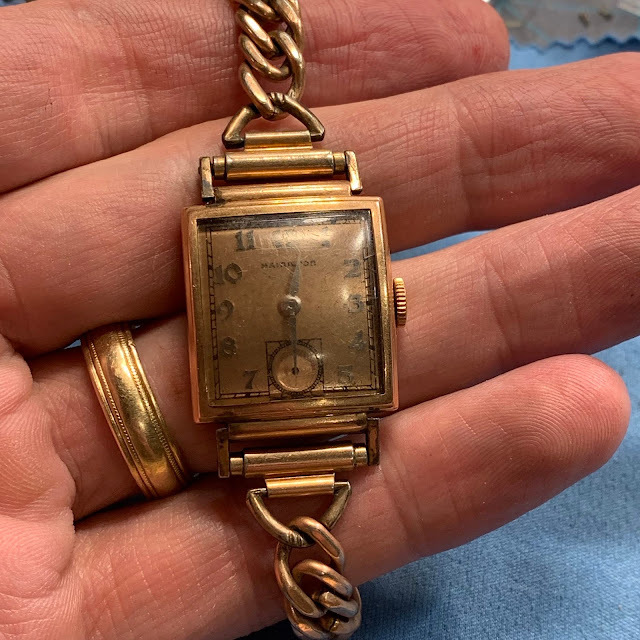 It wasn't an option from the factory but the original jewelry store may have installed 79 years ago. Without the crystal blocking the view, the dial and hands are in remarkably good shape. I wonder what happened to the second hand? 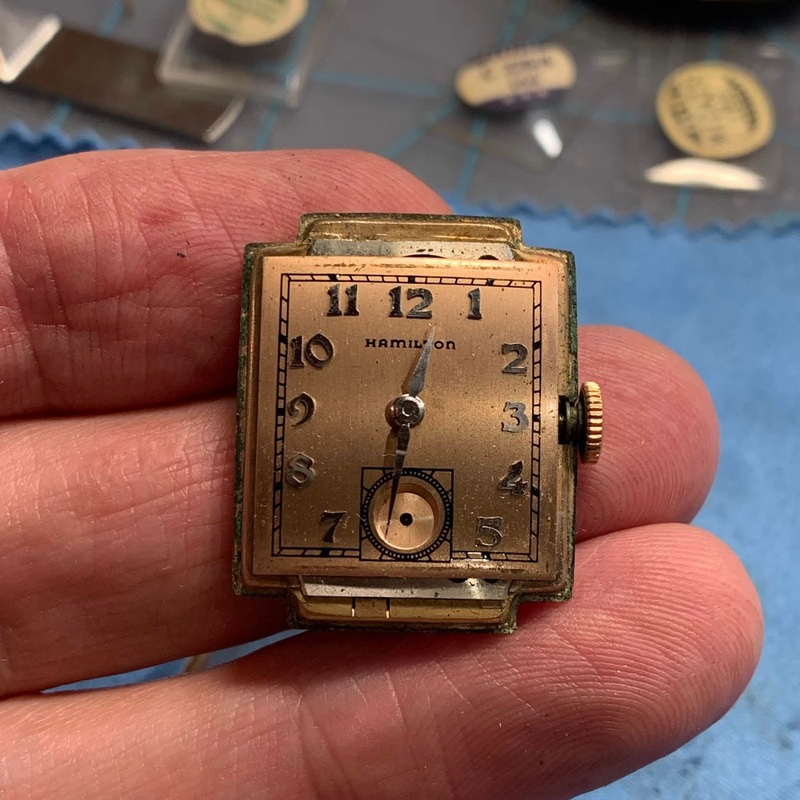 The serial number of the movement dates the watch to 1940, just as you'd expect to see, although a 1941 movement wouldn't be incorrect either. 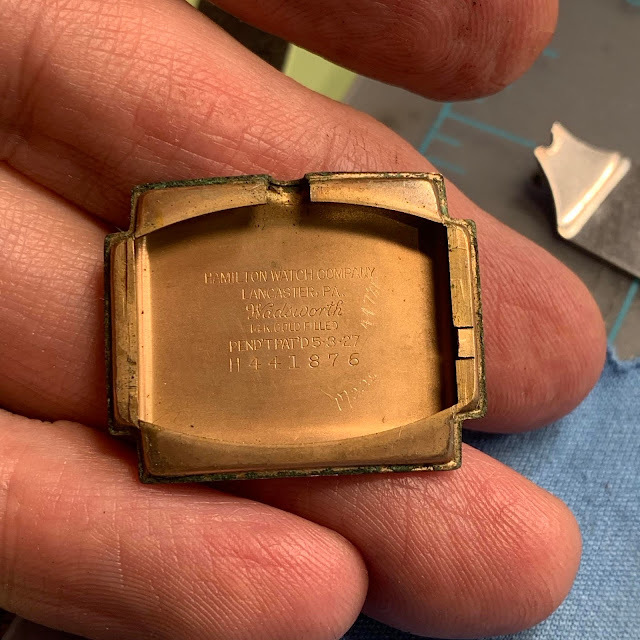 The inside of the case back has a couple of watchmaker's marks inside so it's been overhauled at least twice in almost 80 years. 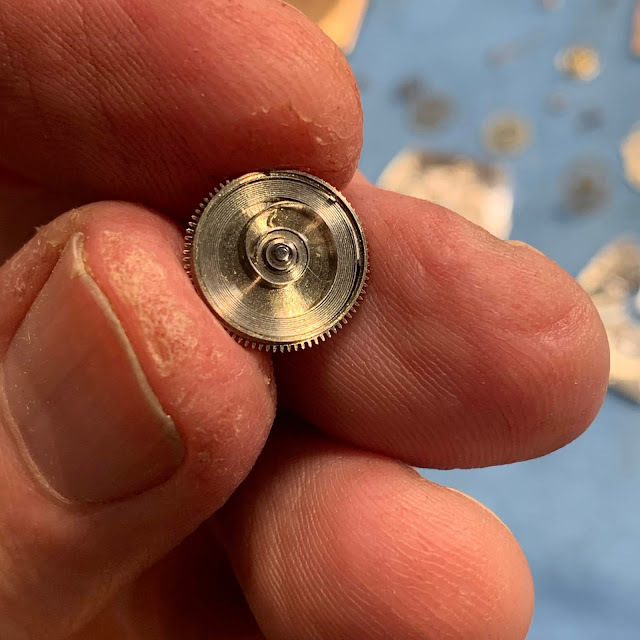 No surprise here, the mainspring in the barrel is a blue alloy spring. It's going to be "set" for sure so I will replace it with a white alloy Dynavar spring. A new glass crystal is definitely in order. This one is double thick so it will protect the case from additional wear from shirt sleeves, etc. 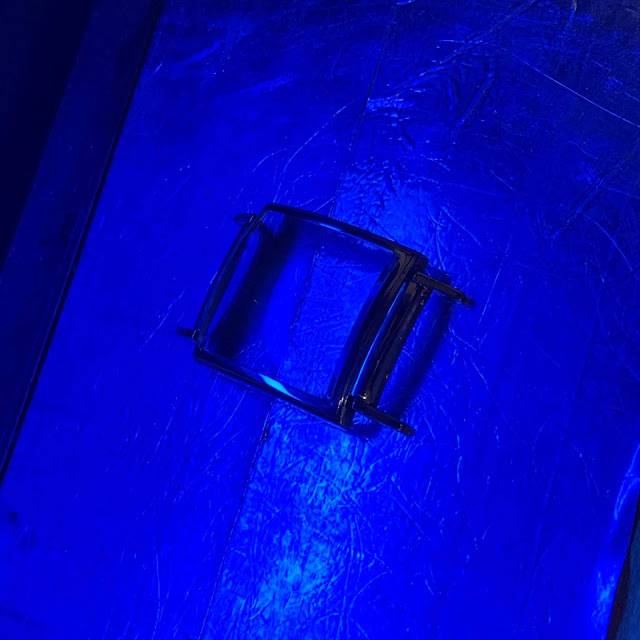 Glass crystals are held in place with UV glue and the glue cures in UV light, or you can take it outside and let the sun take care of it. 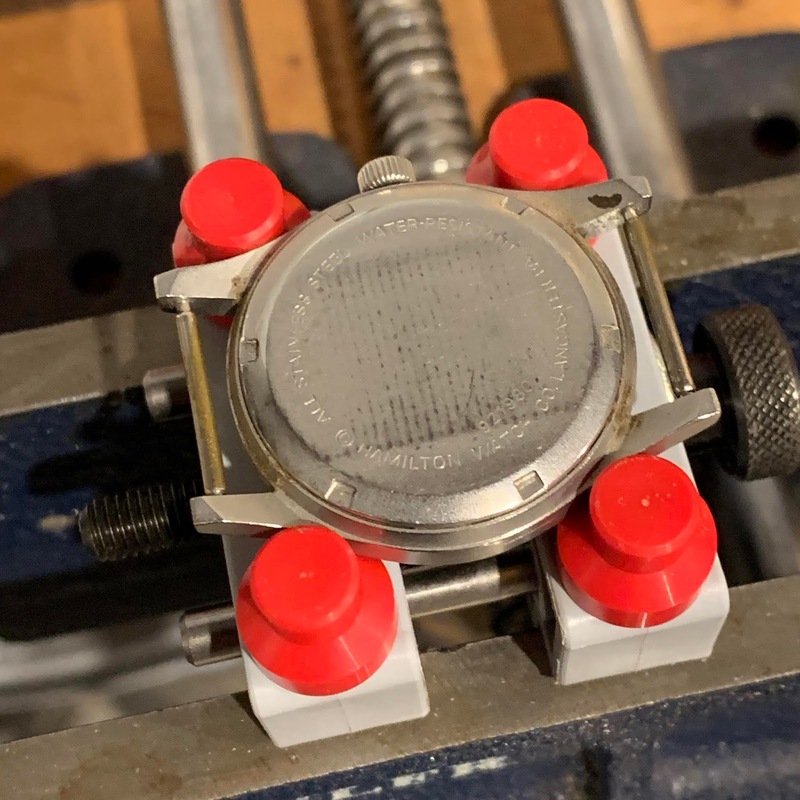 First to be installed is the new mainspring. This will power the watch for 40 hours or thereabouts. It's always a relief to see the balance start moving once it's reinstalled. 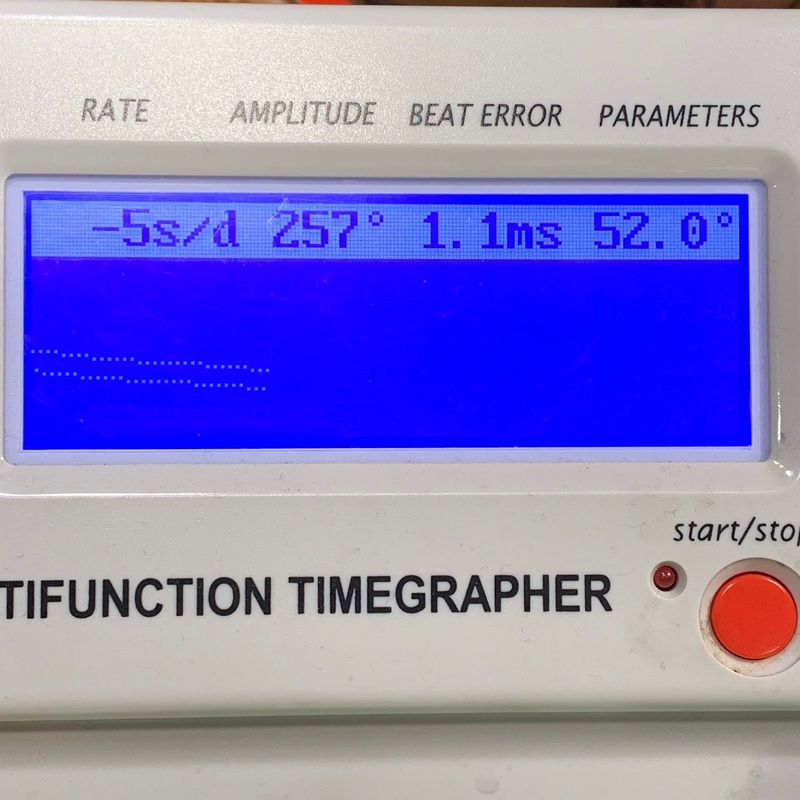 It's got good motion so I'm optimistic that the timer will like what it hears. Not too bad, running a little fast but the amplitude and beat error are within my specs. 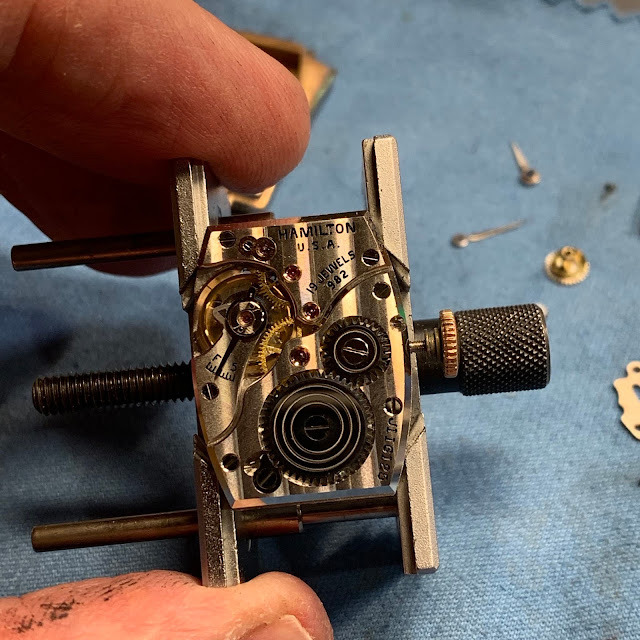 A couple of tweaks to the regulator slows the watch down and you can see the two lines start to approach horizontal. 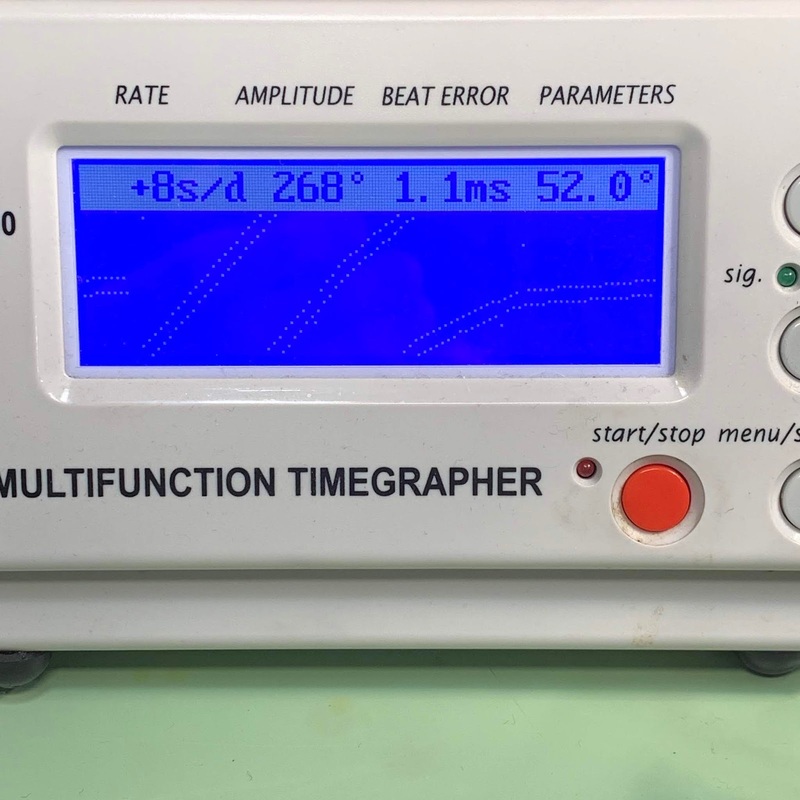 At a perfect beat rate of 18,000 beats per hour the two lines would be perfectly horizontal at zero seconds per day. 8 seconds fast per day is nothing to complain about. What a difference a trip to the spa makes! 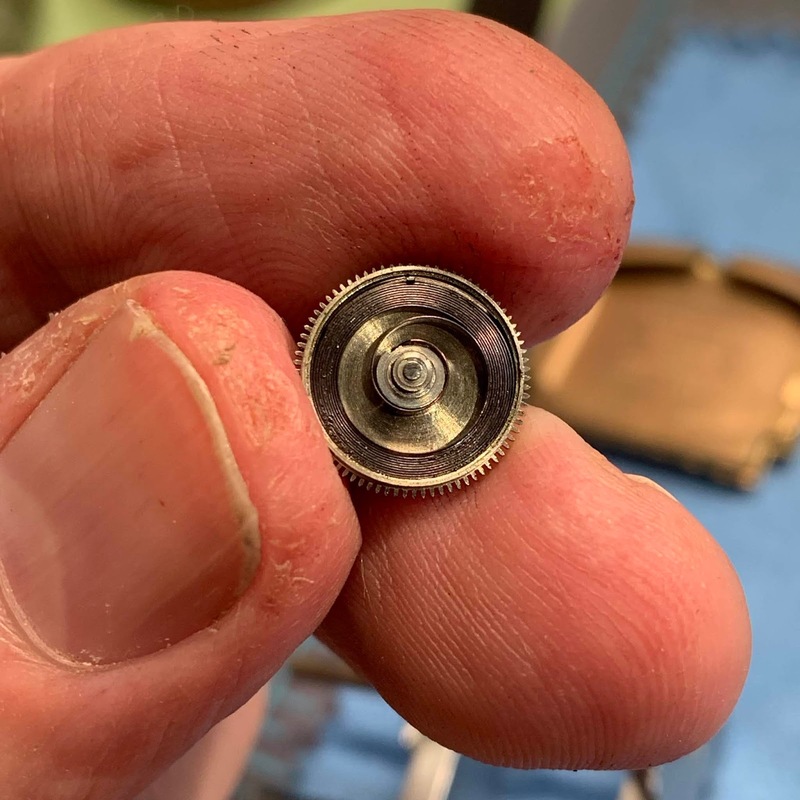 Everything is clean and shiny and even the correct rhodium plated second hand looks like it was there from the beginning. My light tent is merciless so here is a wrist shot with more flattering (realistic) lighting. 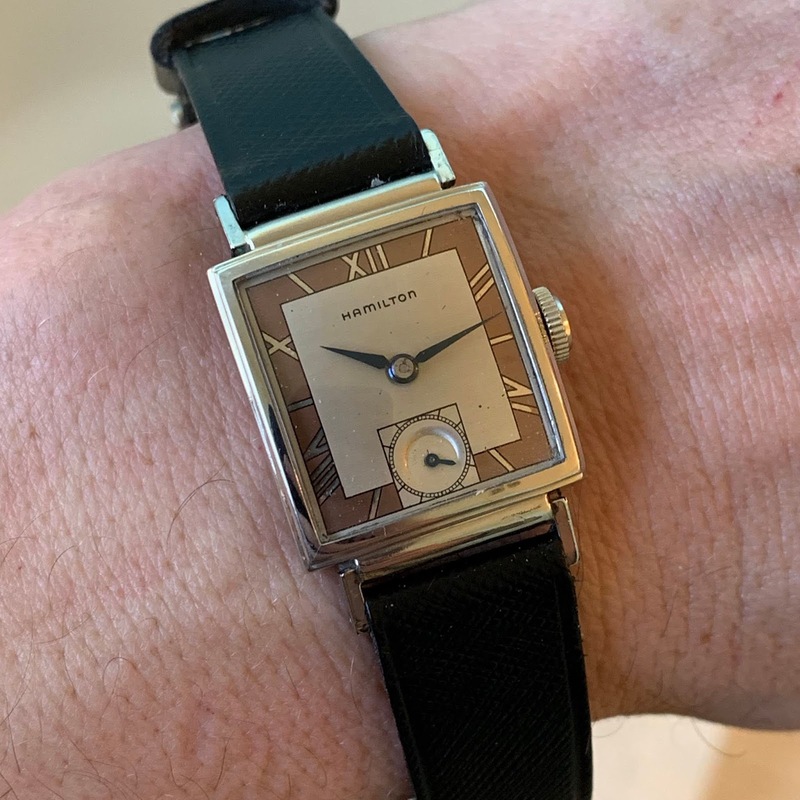 And just to show you why this model is a personal favorite, here's the white Ross with the two-tone gilt and coral dial. Nice, huh? 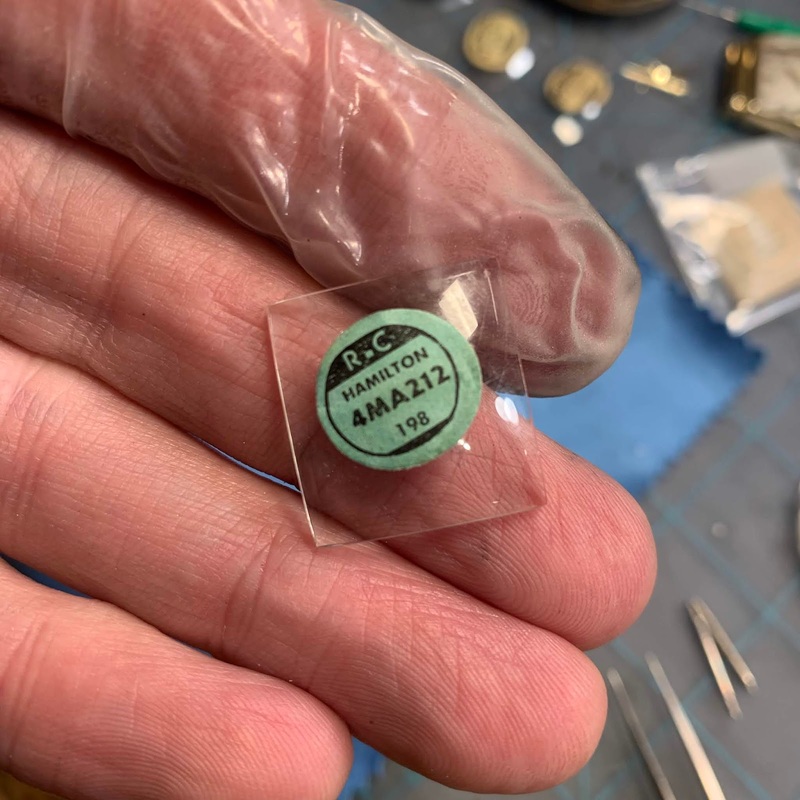 I'm starting to think Hamilton field watches are like Lays potato chips... it's hard to stop with just one. I started with military watches like the Mil-W-46374B, GG-W-113, and the Mil-W-46374D not to mention the British military W-10. 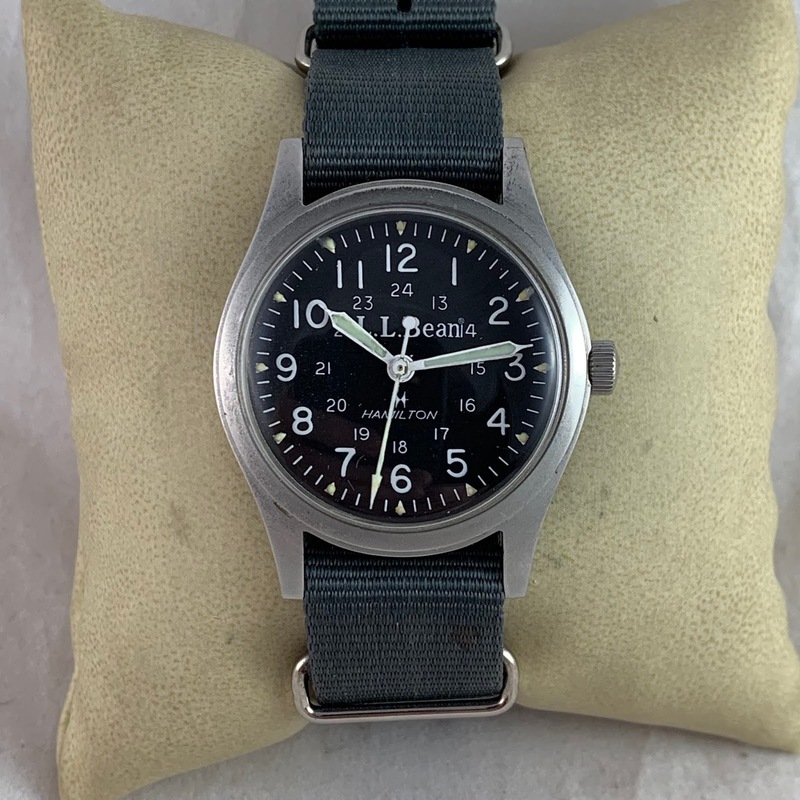 Then I realized there are a couple of different Khaki field models like the 921980 and the 9415A that are based on the same models (at least the GG-W-113 and 46374D. 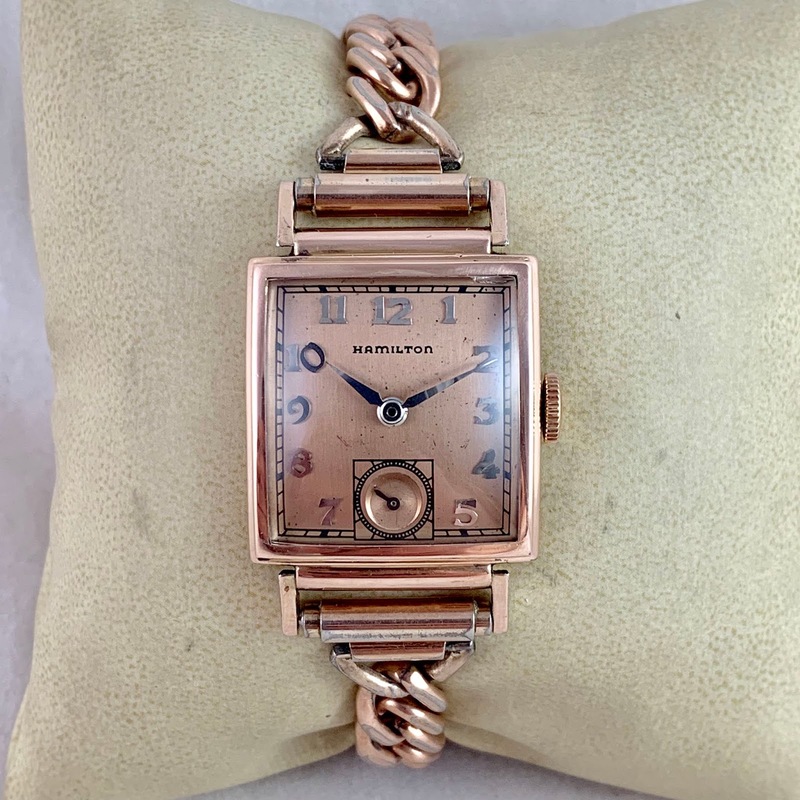 If you look for these watches for sale, you will also see similar Hamilton models co-branded by Brookstone, Orvis, and LL Bean, the latter being very plentiful. 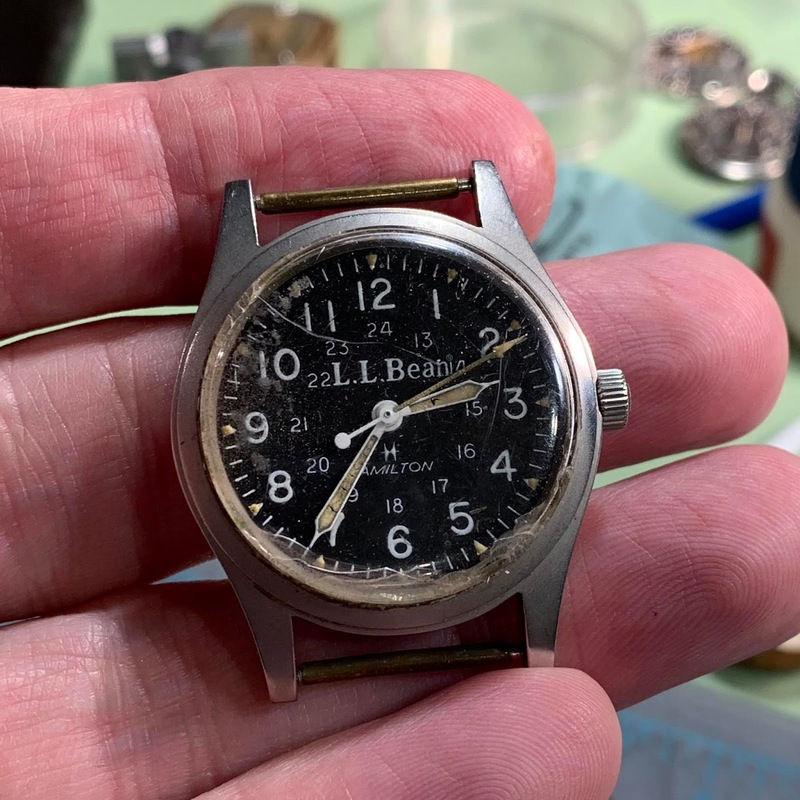 LL Bean is a high quality brand and it's been around for a long time... over 100 years, in fact. 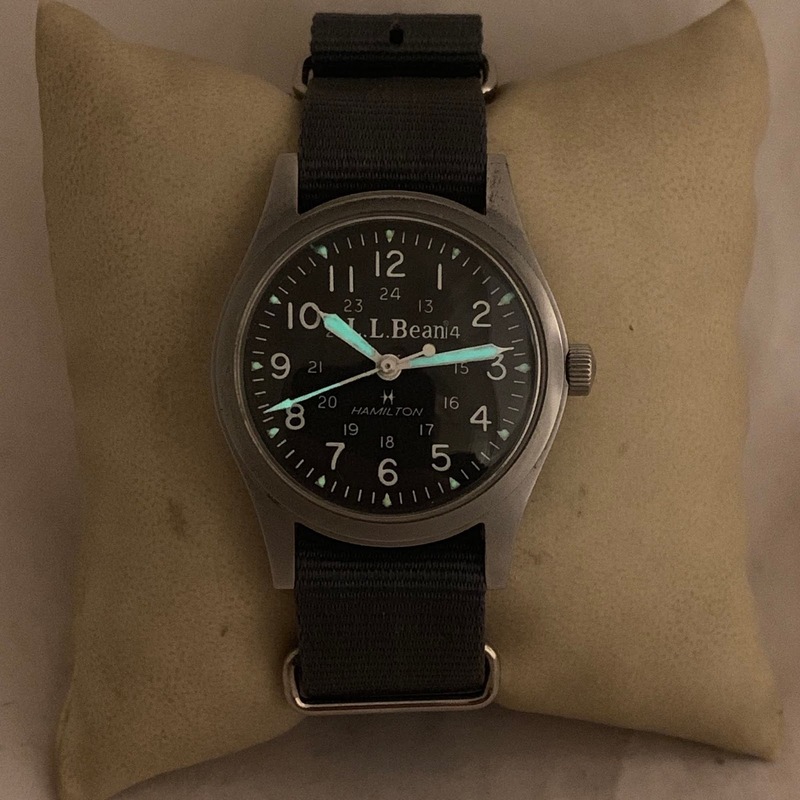 There are lots of different LL Bean-Hamilton Field models, for men and women, the earliest being from the early 1980s, around the same time that the original Khaki was introduced. They came with mechanical movement, quartz movements, even chronographs and pocket watches! 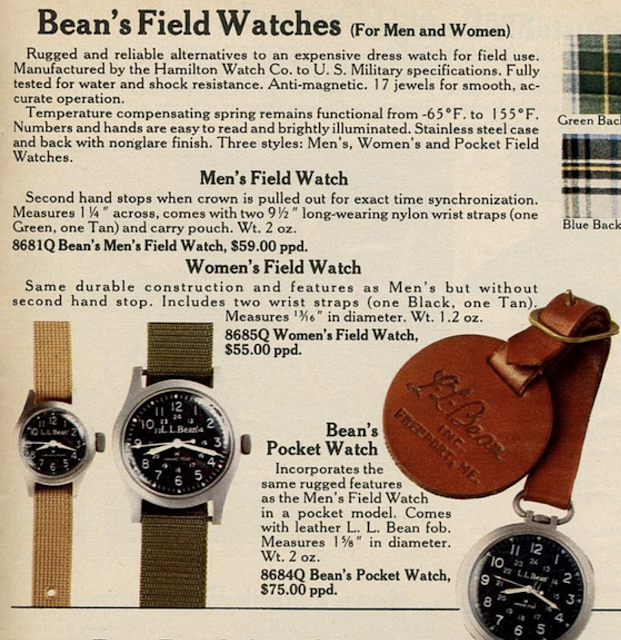 It's no secret that these field watches are quality watches. Even crappy-looking examples will sell online for well over $100. I think that's a little surprising since they're not uncommon and they all tend to look alike. One thing is for sure, I would take any of these field watches over the Mil-W-46374B model with a mere 7-jewel movement. I recently picked up an LL Bean field watch because... well, I couldn't help myself. 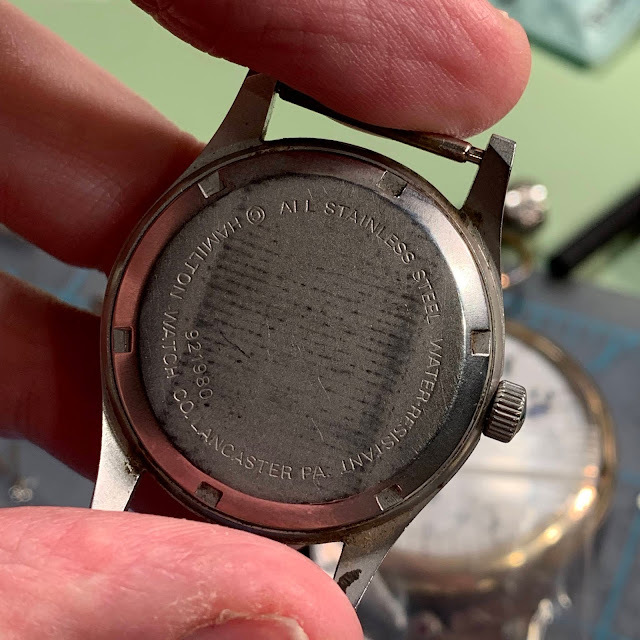 As you can see in the shot below, the watch is very beat up, but it still ticks. 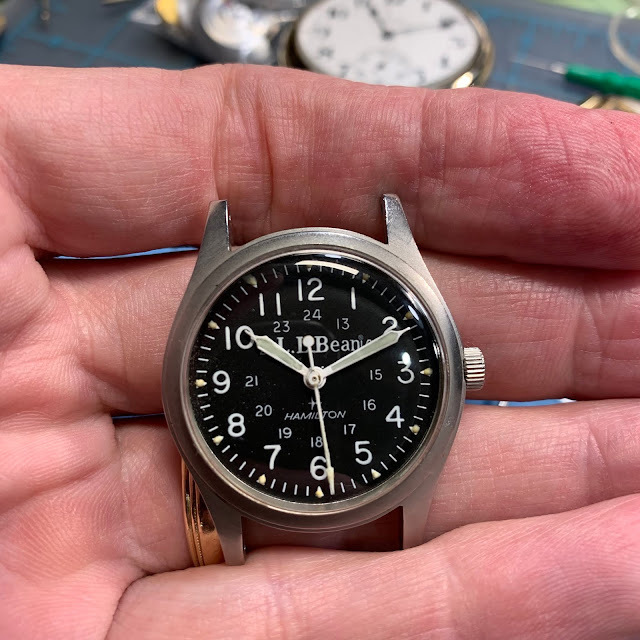 The case back is marked 921980 and is identical to the Khaki model from the same period. 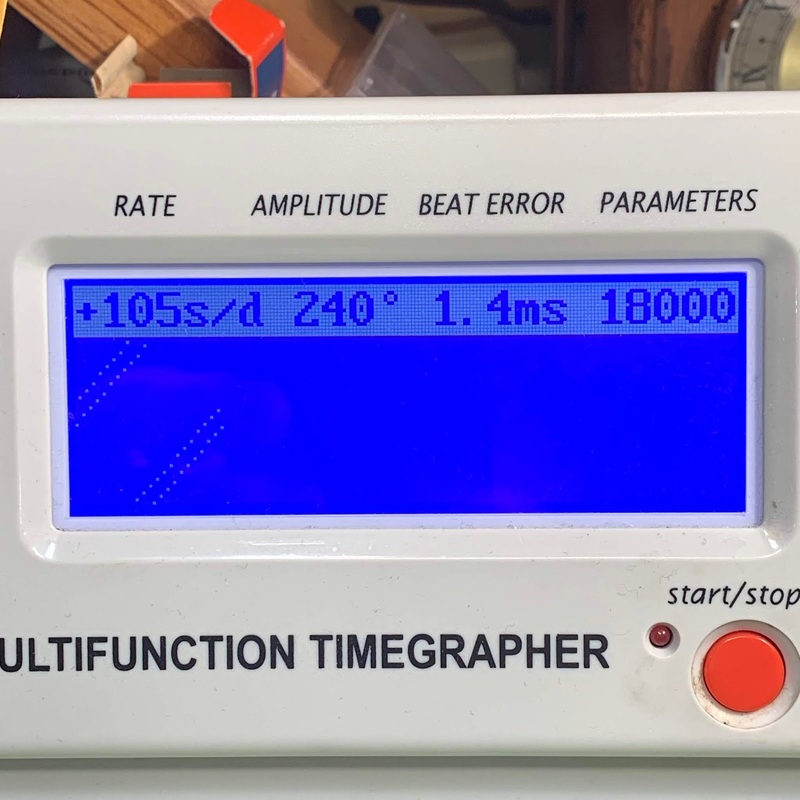 No difference at all, other than the dial. 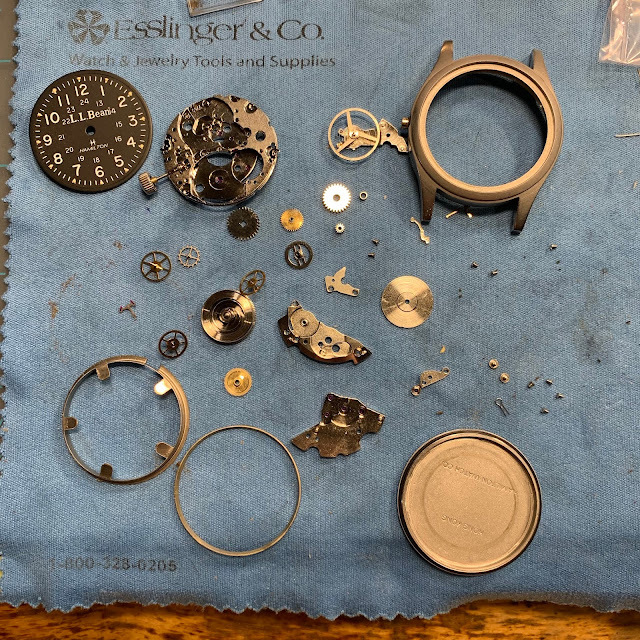 Getting the case back off can sometimes be a challenge since the gasket inside can seize tight. It helps to have a quality case holder paired with a quality case wrench. 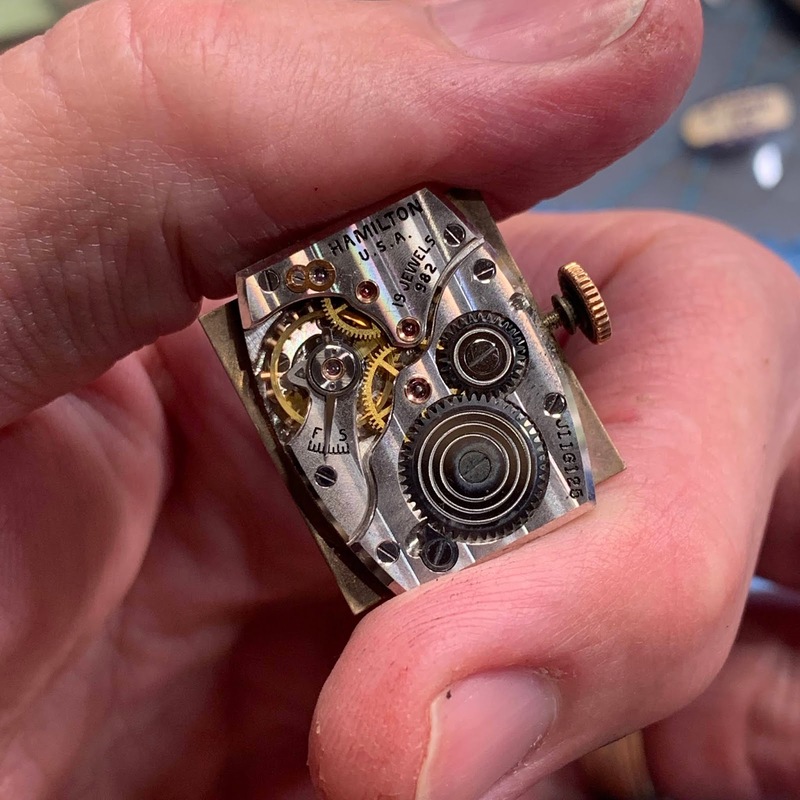 Tucked inside the case is a 17 jewel 649 movement based on an ETA 2750, just like the military models like the W10 and GG-W-113. 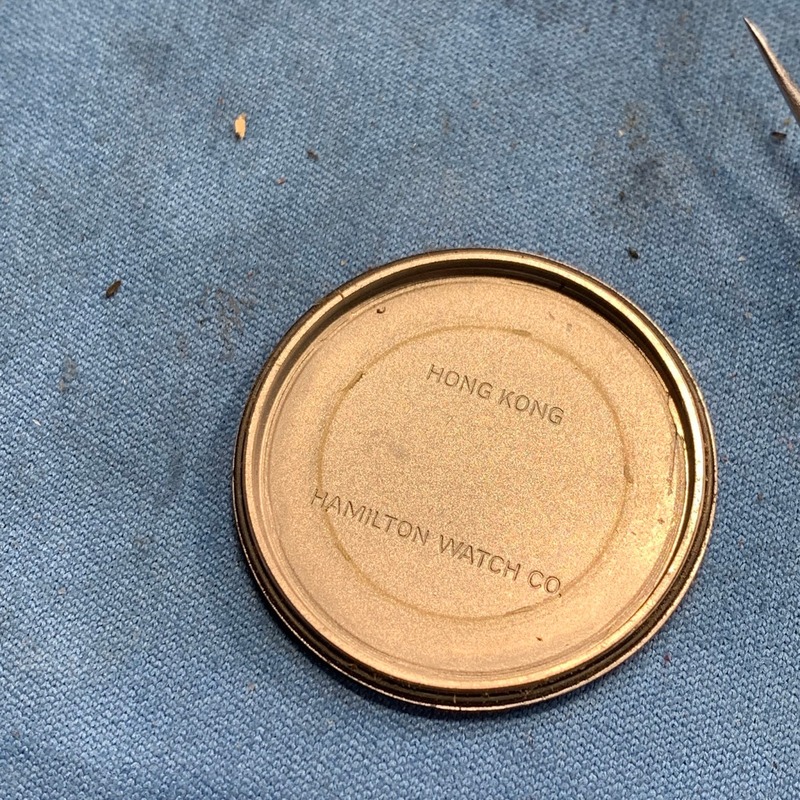 The case back is made in Hong Kong but clearly marked Hamilton Watch Co.
To me, the hardest part of overhauling this movement is to remember to put the hack lever back in place when reassembling the watch. The L-shaped lever is engaged by the clutch so when the clutch slides into the setting position the lever moves over and touches the balance wheel, stopping the watch. While everything is in the cleaner, I will install a new crystal with the original matte reflector ring. That will make a huge improvement over what I started with. The reassembled movement is ticking aware with a brisk motion... noticeably faster than the majority of vintage watches I work on. 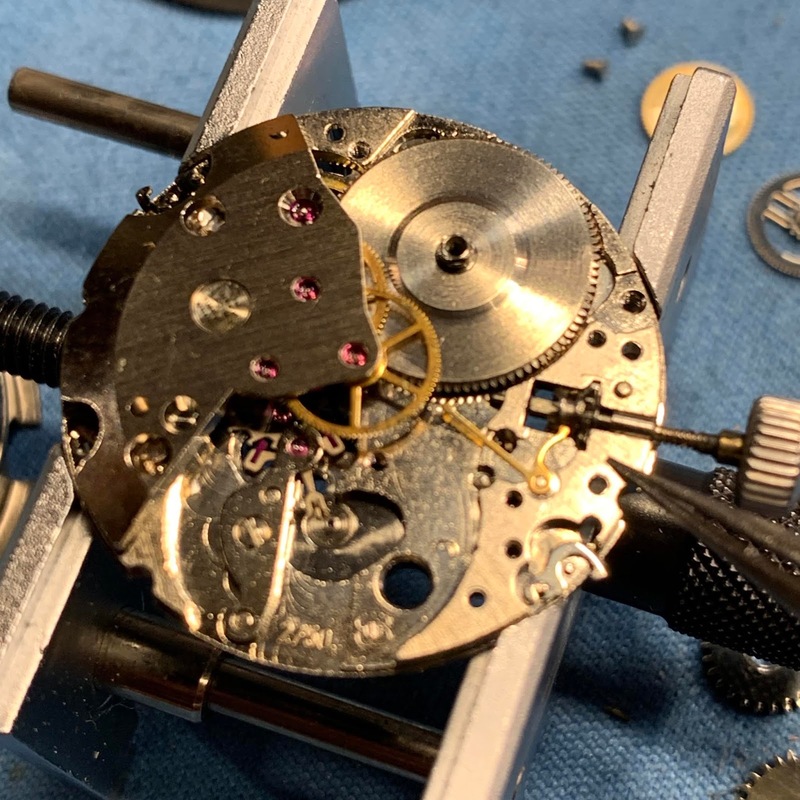 This movement has a 21,600 beat per hour rate, verses the usual 18,000 pre-1969 models have. 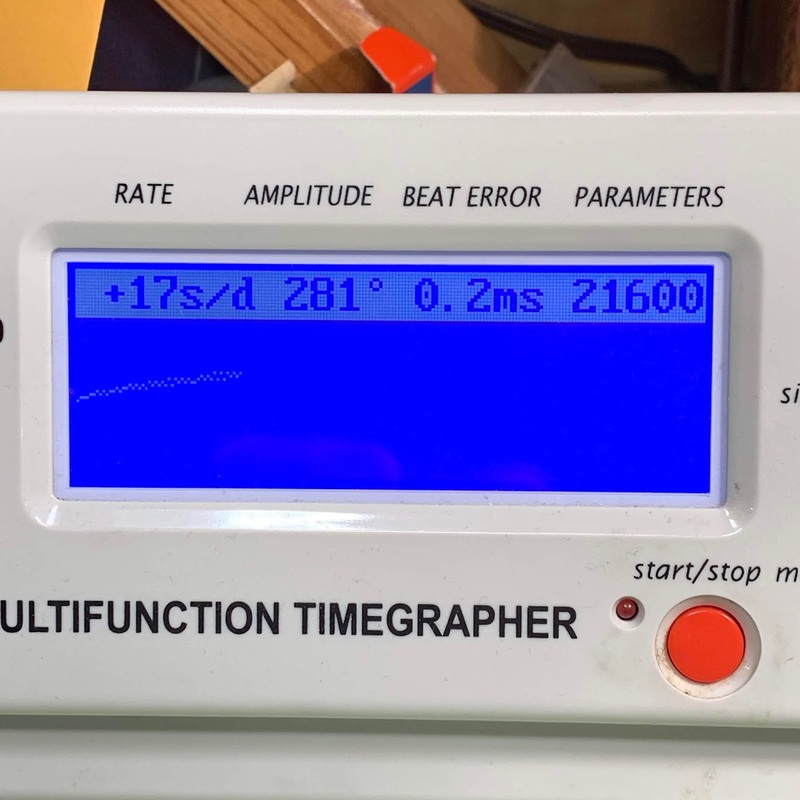 Not too shabby but I can dial it in much further by speeding it up and reducing the beat error. There... just about perfect with great amplitude too. 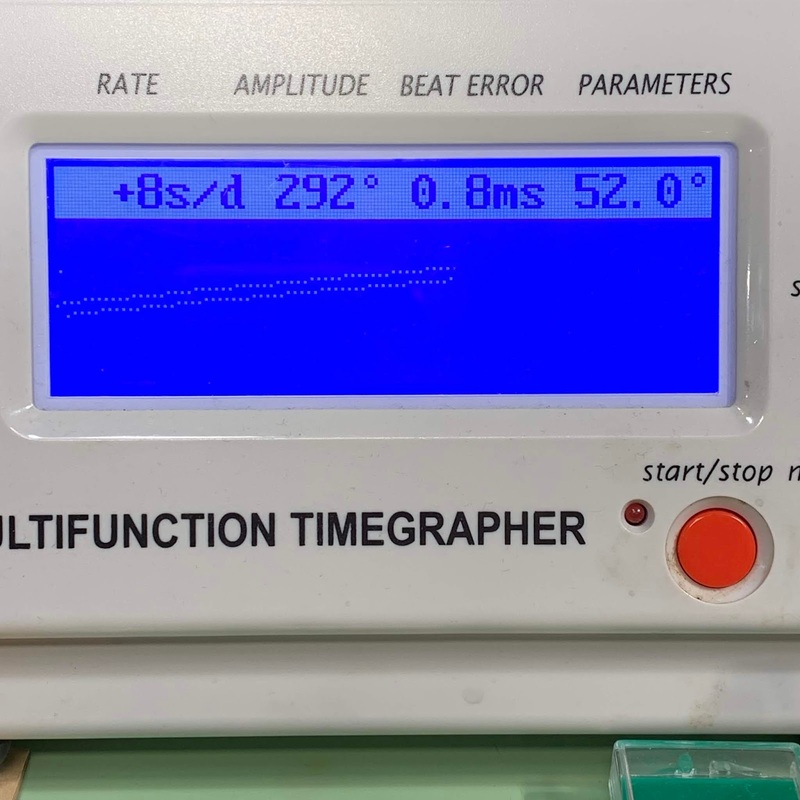 I relumed the dial and hands since the old lume was a bit grungy. 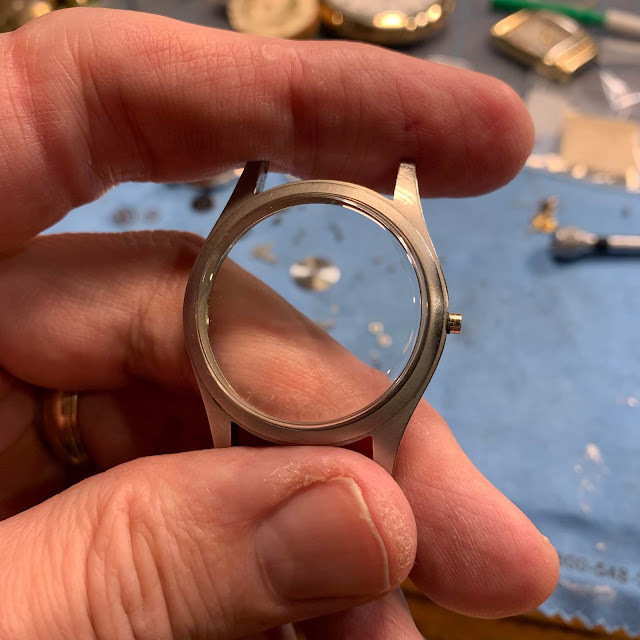 The finished watch looks almost perfect. It certainly looks great, that's for sure.